Rising longevity creates additional risk for your financial health. The AICPA (American Institute of Certified Public Accountants) provides a free public service to consumers who are seeking objective financial information they can trust. The Institute established a panel of top quality CPAs who had earned the prestigious Personal Financial Specialist (PFS) credential that is awarded by the AICPA. These professionals have been designated Money Doctors by the AICPA. They are available to provide free answers to a broad range of consumer questions about complex financial issues. Rob Chapman, Compass Wealth’s founder, is one of only 18 CPAs in the U.S. who received AICPA approval to participate in the Institute’s Money Doctor program. 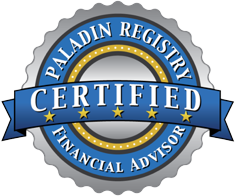 Rob was also named one of the 50 Most Experienced Independent Financial Advisors of just over 1,000 Paladin Registry advisors by BusinessWeek and received a 5 Star quality rating from Paladin Research. See rating criteria elsewhere on this site. Rob is also providing answers to investor questions on Investopedia. Click here to read his answers.